Poet Catherine Pierce: I imagined there might be a mushroom cloud, and there is, but it’s so jarring, the way we see it rising above the whole earth, the way it’s so angular and brightly colored…I really appreciate the in-your-face surprise of that. Artist Ira Joel Haber: I liked the bluntness of it, and the shortness of it and the references to a particular time that I also lived through. 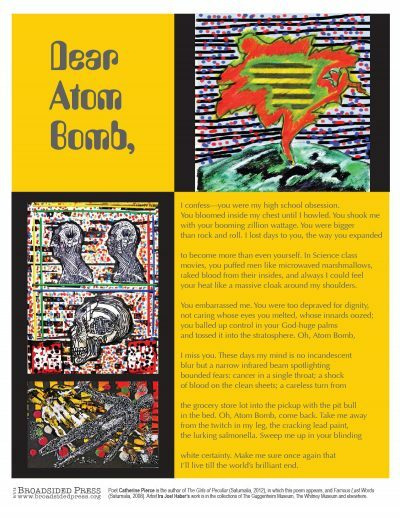 I can’t believe that this is my 13th broadside and I love each one of the collaborations and how different each one is. Poet Catherine Pierce: The skull and body images are so great, and reminded me of how visceral I intended this poem to be (it’s one I’ve read many times, so it’s easy for me to lose sight of that). And the bright primary colors are so unsettling here, so direct, so aggressive. I love that. Artist Ira Joel Haber: I did not want to overtly refer to bombs and disaster, that would have been too easy and too boring. I will admit that I toyed with images of children hiding under school desks and people in gas masks and I suppose some of the results were fine, but I wanted my images to be more subtle but also deathly and colorful. I think the final results are perfect. Poet Catherine Pierce: I like the idea of a collaboration in which both parties work totally independent of one another. Ira and I have never spoken, but I feel like our work fits together remarkably well. Artist Ira Joel Haber: I’m always surprised when I see my work in print, its a strange feeling for me. Love the brightness and the colors of this one. Poet Catherine Pierce: I’ve written a few ekphrastic poems, mainly about photographs—for me, it was about trying to imagine the story that surrounded the moment the image was captured. I find writing about visual art invigorating because of the endless possibilities of interpretation, but also daunting—you’re mucking with something that’s already complete unto itself, so you’d better find a new way into it. Artist Ira Joel Haber: Enjoyable as always… oh, that’s more than one word. Poet Catherine Pierce: Something driving and catchy, with lots of chunky guitar and drums—a Velvet Underground song, maybe. Artist Ira Joel Haber: Rock n roll, baby, rock n roll. Poet Catherine Pierce: My three-year-old has recently taken to painting, and I know I’m biased, but I’m pretty enthralled. Artist Ira Joel Haber: Since I live in New York City I see tons of art. Recently shows were the Gauguin at the MOMA also the Sigmar Polke at the MOMA, the Futurist show at the Guggenheim was extraordinary and difficult because of what they stood for, a real problem but great art. Poet Catherine Pierce: Most recently, Oscar Wilde’s The Picture of Dorian Gray, Sherman Alexie’s Blasphemy, and Keetje Kuipers’s The Keys to the Jail. Artist Ira Joel Haber: Just finished a book on Scientology. Going Clear: Scientology, Hollywood and the Prison of Belief by Lawrence Wright who won the Pulitzer Prize for his book on 9-11 so I knew I could trust him and the scary story that he told. Poet Catherine Pierce: What a fantastic organization this is. I’m very glad to have been a part of this project. Poet Catherine Pierce is the author of The Girls of Peculiar (Saturnalia, 2012), winner of the 2013 Mississippi Institute of Arts and Letters Prize for Poetry, and Famous Last Words (Saturnalia, 2008), winner of the Saturnalia Books Poetry Prize. She lives in Starkville, Mississippi, where she co-directs the creative writing program at Mississippi State University. This poem first appeared in Indiana Review and is included in The Girls of Peculiar. Poet Catherine Pierce Vectorizing in Rehoboth Beach, Delaware. Artist Ira Joel Haber Vectorizes his apartment.